Thanks for taking the time to compare my photo to your V6 pins. Do you have the original V6 shoes or the modified D750-compatible version? I share your thoughts that front pin presents a vertical face to the hot shoe. Due to the length of the pin the angle of attack is nearly perpendicular, and a shorter pin and/or a less rigid spring would likely help. The pins on all my flashes are significantly shorter, so it seems this could be accomplished as you suggest without compromising the electrical connections. I do check that the locking lever is fully to the left before mounting. I don't think the slight protrusion of the locking pin is the problem, though, as even the V6 units with pins that don't retract fully will mount when inserted backwards. That's why I believe that the electrical pins are the most likely culprit at this point, for the reasons we're discussing. I can't get to my camera box in the bedroom right now (wife sleeping) to test angling the V6 slightly upwards, but we did try wiggling them in different orientations to mount them last night. But there is another reason I'm hesitant to try again. Some of the V6's pins slide across the recessed grooves in the plastic part of the camera's hot shoe, left and right of center. After all that pushing and pulling last night, there was significant wear to the plastic on my D750. My son uses flash less often than I do and his shoe showed similar wear after our attempts last night. Both our cameras are fairly new, his only about 6 months old. I speculate that the V6's pins cause abnormally high wear to the softer plastic. This would explain why the V6s would initially mount on our cameras but not later. The plastic may have worn away enough that there isn't enough left to push the pins up. As I say, this is all speculative, but it's enough to put me off trying again until I hear from Cactus. Thanks for joining in to help, Class A. I appreciate hearing your thoughts. Hi, Class A, Thanks for taking the time to compare my photo to your V6 pins. Do you have the original V6 shoes or the modified D750-compatible version? I have the original V6. I share your thoughts that front pin presents a vertical face to the hot shoe. Due to the length of the pin the angle of attack is nearly perpendicular, and a shorter pin and/or a less rigid spring would likely help. I noticed that on my Pentax cameras, the surface facing the pins is angled itself, meaning that pins will naturally get pushed up. Perhaps that's why I'm not experiencing any mounting difficulties myself. I do check that the locking lever is fully to the left before mounting. I don't think the slight protrusion of the locking pin is the problem, though, as even the V6 units with pins that don't retract fully will mount when inserted backwards. Interesting, on my V6 the locking pin completely retreats. There is no protrusion left whatsoever. After all that pushing and pulling last night, there was significant wear to the plastic on my D750. Sorry to hear that. 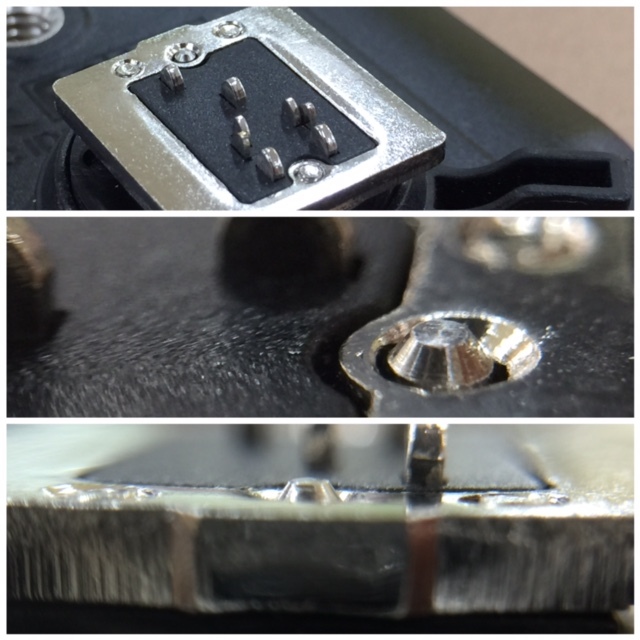 My Pentax cameras use a hard plastic in that area as well, but there are dedicatd grooves for the pins. However even the non-Pentax pins of the V6 seem to leave the material unaffected. I had a meeting with our QC and technical director and learned that the varying "height" of the locking pin is due to aging plastic spring inside over time. However, replacing your 5 units we tested all of them with the D750 so there were no mounting issues with our camera. The spring-loaded pins have always been quite "pushy" and would definitely act different than your dedicated Nikon shoes because they were made to mount on a NIkon camera. But the V6 is made to fit on various systems so it's small on some and biffy on certain others. I once tested the V6 on a Lumix GF1 and I had to take away the hot shoe spring in order to mount the V6 smoothly - with much wiggling. You may try taking it off and see if it helps? If it's the locking pin that's causing the problem then removing the spring plate wouldn't help. I have just swapped one of my V6 with the special hot shoe and it has no problem mounting on the D750. The locking pin does sticks out a very little but has no effect on mounting. I also tried on a D3200 and has no problem either. See below image. your units to us for service. For that, I thank you for your understanding and patience with us. stressing out the plastic spring inside. First, thank you for taking the time to discuss this internally and try to find a solution for me. I had to take away the hot shoe spring in order to mount the V6 smoothly - with much wiggling. You may try taking it off and see if it helps? If it's the locking pin that's causing the problem then removing the spring plate wouldn't help. 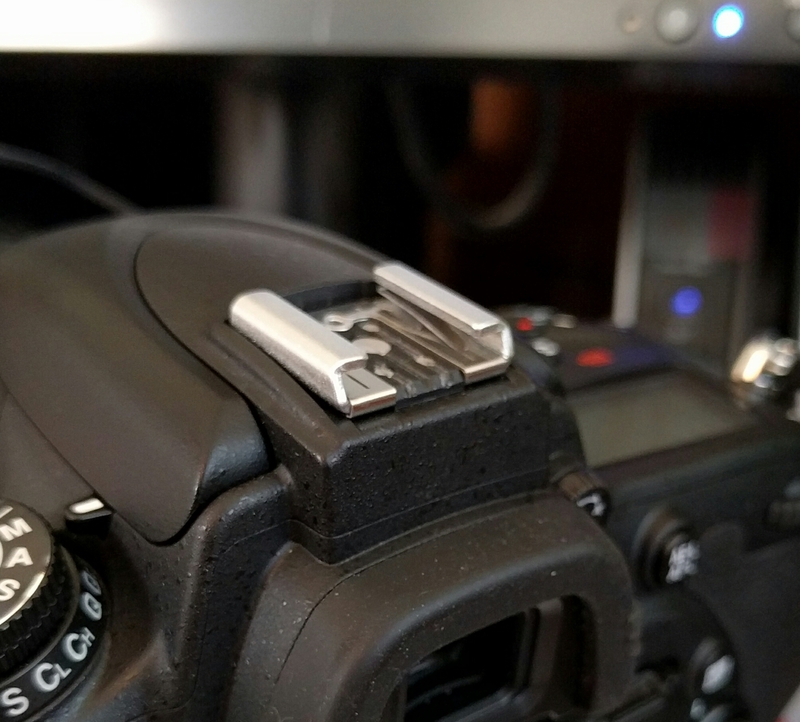 Do I understand that the hot shoe spring is something that I can remove myself? I'm fairly handy and willing to try with some guidance. As I mentioned to @Class A, the V6s mount easily when I slide them into the hot shoe backward, so I don't think the slight protrusion of the locking pin or its spring are at issue, but I do think removing the inner spring behind the electrical connecting pins would help. As an aside, I read your earlier posts about not exerting too much force on the Hot Shoe Lock Lever before receiving my V6s and have always taken care to stop pushing once it hits the hard stop. Thanks again for your help. Sorry, I'm not sure why the rest of my message after quoting you didn't post. Do I understand you correctly that the hot shoe spring is something I can try removing myself? I'm fairly handy and am willing to try with some guidance. As I wrote earlier, I don't think the locking pin's slight protrusion is at issue as the V6s will mount backward. I do think that removing the springs behind the electrical contact pins may help, though. As an aside, I read your post regarding not pushing the locking pin lever with too much force prior to receiving my V6s and have taken care to stop pushing once it hits the hard stop. Thanks again for your help. 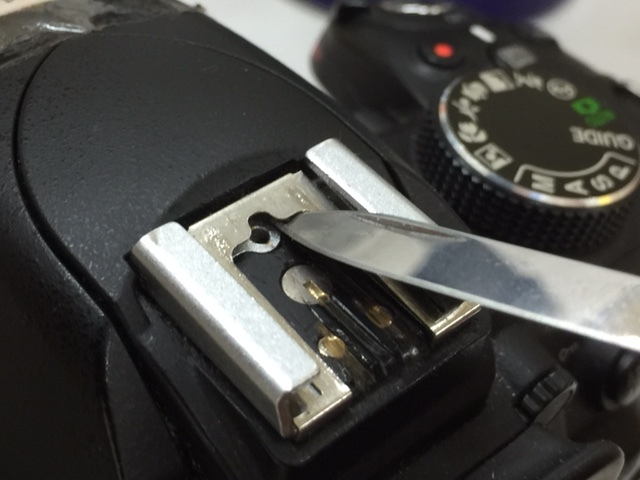 Yes you can remove the hot shoe spring by simply by lifting the front and I used an swiss army knife. You can also use a mini screwdriver. Again, this may or may not help with your mounting issue, but worth a try. The "springs behind the electrical contact pin" - which ones are you referring to? I respect very much your design and the elegance of the thumb lock, but maybe you should consider reengineering this in future iterations. Since as you say the V6 has to be able to mount on many hotshoes, a locking screw that lowers the pin more accurately and tightens the V6 on the hotshoe guides might be a better solution. That would allow to lower the pin just enough and additionally secure the V6 on the camera. Thanks for the photos. When you mentioned the hot shoe spring, I thought this was a spring in the V6 that pushes its electrical contact pins downward in the camera's hot shoe, and not the one on the camera. I wouldn't want to remove the camera's spring as this would affect flashes mounted directly to the shoe. While I originally suspected the locking pin, I don't presently think the locking pin or its spring are causing the problem. One of my V6s has a locking pin that's actually slightly below the surface, and it won't mount now on either of our cameras, and as I've mentioned, all my V6s will mount in the backward orientation. So at this point, I don't think replacing the locking pin's spring will help. I've attached a photo of my camera's hot shoe to show the wear on the plastic portion. This wear is why I don't think the V6s are mounting anymore. As you can see, the wearing is predominantly on either side of center where the electrical contact pins would slide. The center shows what appears to me to be rather normal wear as compared to the sides. Is the wear on the plastic only happens after you use the modified D750 hotshoe for V6? Do you notice these wear before modifying your V6s? How long you have been using Cactus V6? I am D750 user too. That's why I concern about your issues. Thank you for sharing. I can't say for sure. It's only conjecture on my part, based upon my ability to mount the V6s with the new shoes on our cameras shortly after they arrived, but not now. Upon further inspection in house we found out it's the two screws on either side of the locking pin that is causing the mounting problem. It is almost impossible to spot with bare eyes whether the screws are popping above the metal surface of the hot shoe that it catches the camera's hot shoe mount. I did a not-so accurate test by running my finger nail across the top and the two screws, and if the tip of the screws catch your nail then it's likely that the screws were put on too tightly. To loosen the screws you would need to open the casing of the V6. We recommend doing that for you as it is complicated to reassemble it. So please send it back and we will cover shipping both ways. Thank you again for your understanding during this time. FWIW, I once took a V6 apart -- I was just curious to see what was inside -- and was able to put it together again. It is a fiddly process and one definitely should proceed slowly and carefully. For instance, when disassembling one needs to be careful not to rip off the cable to the hot-shoe connector. I'd only recommend it to someone who is comfortable dealing with small electronics and sets aside a generous amount of time. There are multiple parts that need to but in place in one half of the V6 that one must not move out of position when attaching the other half again and one may need multiple attempts for this "marriage" to succeed. Thanks for your reply @CDlight. I am going to order mine. Hopefully won't be any issue. I responded to your PM and just mailed the triggers off, but wanted to update the forum thread. I could feel some of the screws on my V6s catch on my fingernail, but not all of them. Still, I decided to take up Cactus' offer to send them back as I'd like to have the original shoes replaced, please. Once bitten, twice shy, and I'd rather deal with jiggling the triggers into my camera's hot shoe than the uncertainties introduced by the new shoes. I'm sure the new shoes work fine for others, but with the problems on my particular D750 this seems the safest route for me. I forgot to put a note in the box, so I'd appreciate it if you'd communicate this to whoever does the shoe swap. As I wrote in my PM, Cactus has proved that it is a class act. You and the design & QC teams have gone to great lengths to help resolve my issues with the V6s, and I am very appreciative of your time and leadership of this effort. I lead a service delivery team and I know how much work it takes to research and respond to customers' complaints. I applaud you and Cactus for your courteous, timely and efficient responses to my reports. Thank you for investing yourself in helping me. I am quite grateful. @CDLight, I very much appreciate your cooperation and patience over the past couple of weeks. We will check your returning V6 units thoroughly on our D750, for mounting, wiggling / contacts issues for TTL pass through. FYI our R&D Director had a meeting with the entire team so everyone knows about it. We applied the same checking standards immediately, so @yungyaw's order has been tested. Thank you again and I look forward to fiixing the problem for you so you can use your Cactus gear with ease and focus on producing great images. @Antonio, would you please verify that the shoes will be swapped for the original version? Other than that, I couldn't be more pleased. My next big shoot isn't until February, so hopefully all will be resolved by then. Thanks again for all your help. @CDLight so you want the original, non-D750 version, hot shoe? @Antonio, If I understand the issue correctly, TTL Pass Through works with original V6. Just that the hotshoe alignment is a bit off. So one needs to wiggle a bit until proper contact is made before locking down the level. Is that correct? @Antonio, I believe @yungyaw is right. I was able to use TTL Pass Through with the original shoe, but it was a little hit-or-miss until I wiggled it into the right position. Actually no, the special shoe more stableon the D750, with less or no wiggling for TTL Pass Through to work. As mentioned previosly, the special shoe has spaces to wiggle still because we made a compromise by making it still compatible with other camera models. If we go all out and make a truly-dedicated D750 version it will not work on any other cameras. So if you change to using another camera you will need to mail it back and swap back to the original hot shoe. So in conclusion, the special shoe (plate) is still better than the original one in terms of doing TTL Pass Through. @Antonio, thanks for the further explanation of the differences between the original and special D750 plates for the V6. I understand the principle, but will stick with the originals for my V6s. Thank you, and have a Merry Christmas, everyone! Thanks @CDLight. I will test the ones you sent back first and confirm what went wrong with them. But you sure you want the original shoes? And on all of them? Are you getting a new camera (in 2 days... Boxing Day!)? Hey everyone, wish you all a happy start of 2016! I have an update for Nikon D750 users. We have successuflly tweaked the previuos "special hot shoe for D750" so that it will work reliably on Nikon D750 for TTL Pass Through and still be compatible on other cameras with standard ISO hot shoes. So there are no longer a D750 version of the metal hot shoe plate, there is only one version now and we are using this plate in our standard production batch; the older metal shoes have been phased out. However, please take note that tolerance issues* still exists on the new hot shoe when used on the D750. Therefore, customers wishing to purchase a V6 for a D750 still need to alert us and we will then specially test and make sure the V6 unit works with TTL pass through on the D750. *FYI, during my hand-picked tests of 15 units, 3 (20%) of them could not work straight of the bat - I had to wiggle the V6 before TTL pass through works. The good ones worked every single time. TIPS: Choose the corresponding flash profile on the V6 TX unit and enable TTL pass through by press and hold the MENU button for 3 seconds.